The T-37 was affectionately known as the "Tweet" or "Tweety-Bird". Over a period of fifty years, more than 78,000 U. S. Air Force pilots received their initial training in the T-37. 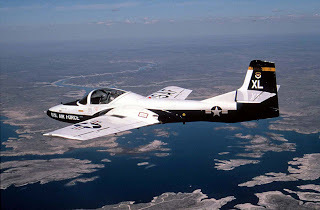 Now being replaced by the T-6A (Texan II), the T-37 will be officially retired from service on the 31st of this month. Responding to a USAF request in 1952 for a lightweight basic trainer, Cessna offered this twin-jet with side-by-side seating. The Air Force liked what they saw and the first prototype was flying in 1954. The wide track and a steerable nose wheel made it easy to handle on the ground, and the short landing gear eliminated the need for access ladders and service stands. The aircraft was designed for simple maintenance and had more than a hundred service panels and doors. Experienced ground crews could change an engine in half an hour. The twin Continental-Teledyne J69-T-9 turbojet engines used were license built copies of the French Turbomeca Marboré engine (the same engine as in the Cold War Air Museum's Fouga). Since the short landing gear placed the engine close to the ground, screens pivoted over the intakes from underneath when the landing gear was extended, to prevent foreign object damage. The A-37 was an armed variant of the Tweet. Developed as a light attack or Counter Insurgency (COIN) design in 1963, the "Dragonfly" had bigger engines, more hard points and more range (or loiter time). The dual controls were retained, so it could still be used as an operational trainer and the second seat was available for an observer when used in the Forward Air Control (FAC) role. 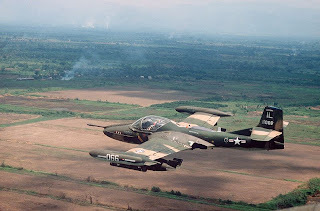 The A-37 saw extensive use in Vietnam. This aircraft, on display at the Military History Museum in Ho Chi Minh City (Saigon), is a veteran of that conflict. Twenty countries flew or operated the T-37 and fourteen flew or operated the A-37, making it one of the more widely used and longer lived military light jet designs.